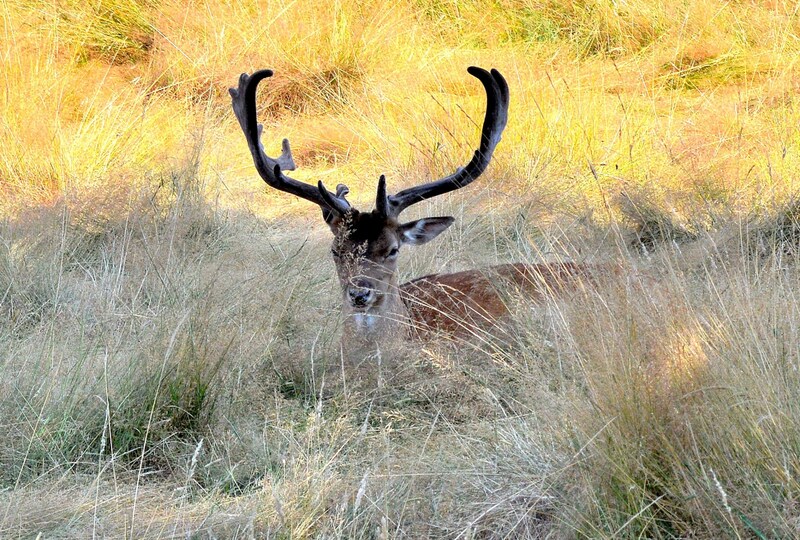 I went to Bushy Park in search of green parrots, but found deer instead . There are a number of flocks of green parrot around London, thought to have escaped and managed to adapt to our UK winter. I hadn’t thought about it, photographing green parrots amongst a summer of verdant green leaf wasn’t going to be possible. I heard them and occasionally saw a quick flash of green wing but that was all. I was delighted to find deer instead. 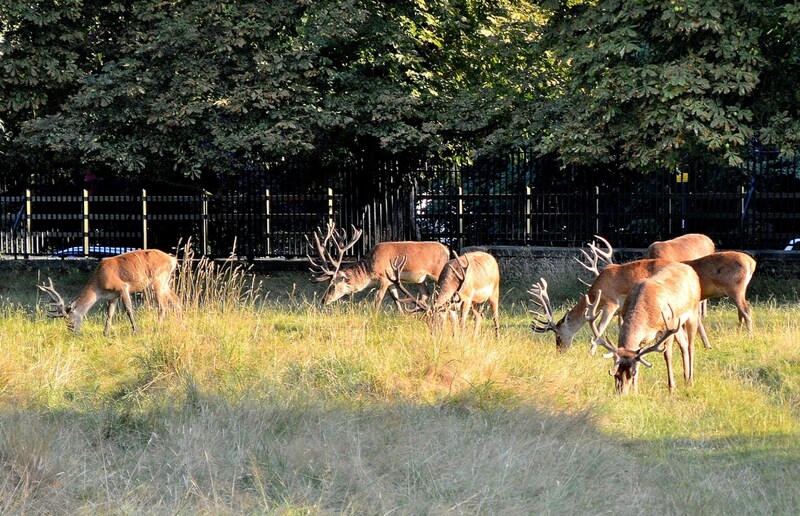 I knew they were in Richmond Park and Hampton Court Deer park but pleasantly surprised to find them here. 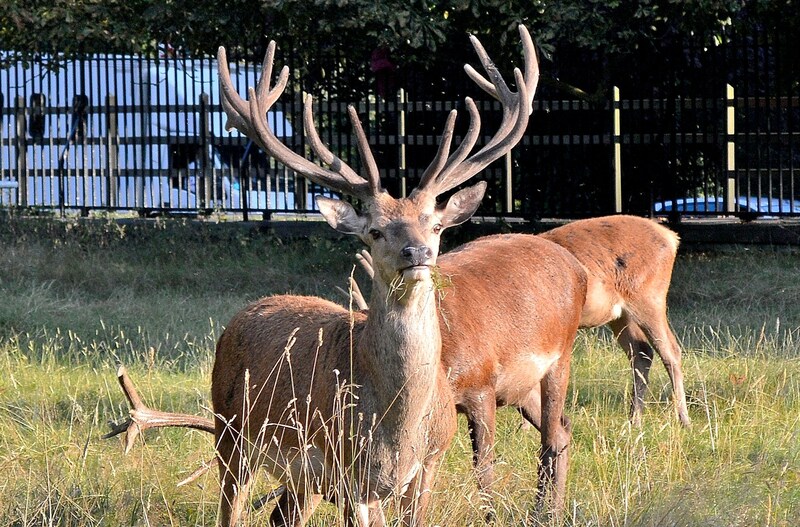 Photographed in early August they still had velvet on their antlers. The Black Prince, and I think he knows it. 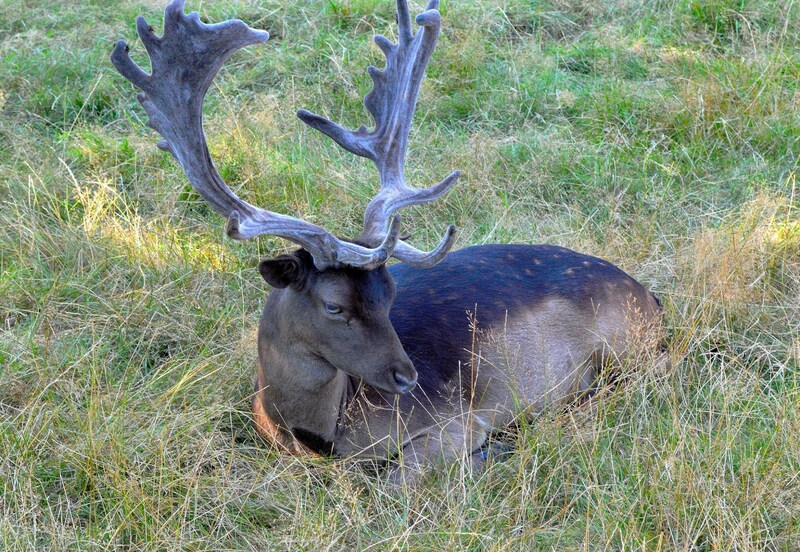 Black deer are quite rare but do live amongst the herd. 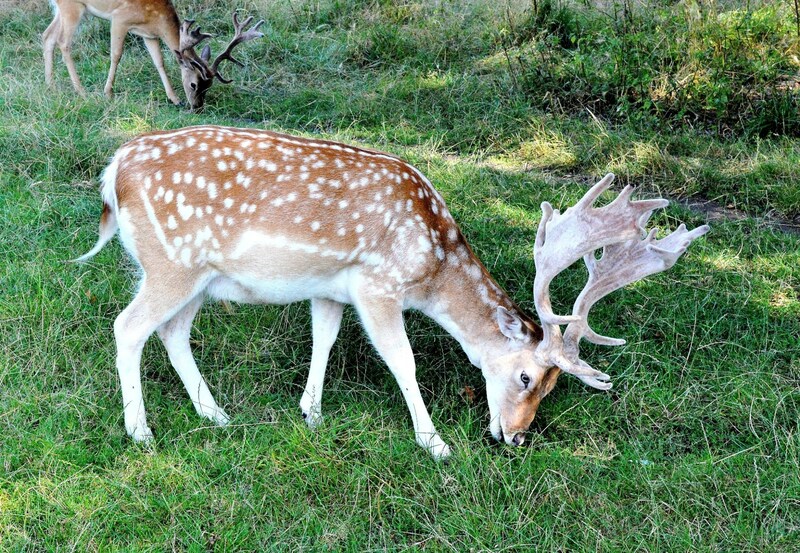 The above were happily grazing amongst the fallow deer, although they are probably reds. It’s mid-summer, live and let live. Red deer are the largest of deer-kind with the exception of moose and elk. 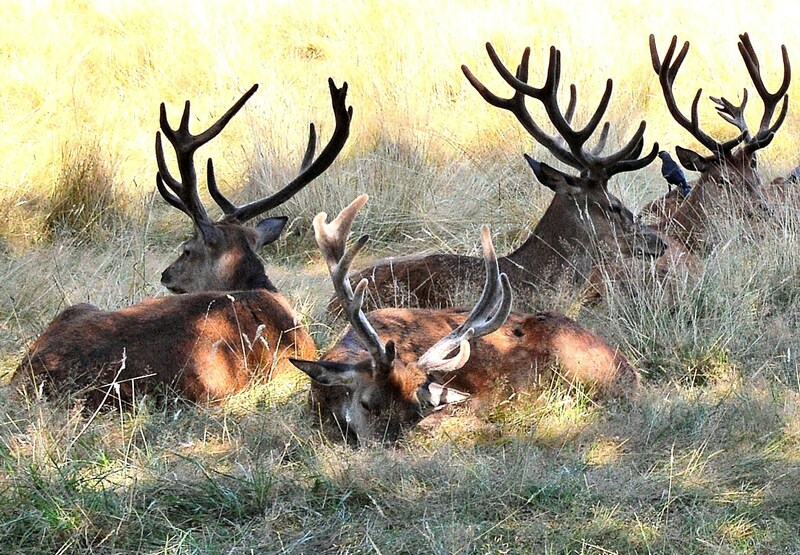 Found at southern end of Bushy Park, they were not so much a herd as a squad. They have the unnerving and unerring ability to raise their heads at exactly the same time. Much like a bristling of antennas. One can almost hear “Have you got permission to be here and have got any ID. Deer are generally not dangerous but one must be careful in spring when there are young about and in autumn when they are rutting. They will also attack and sometimes kill dogs. 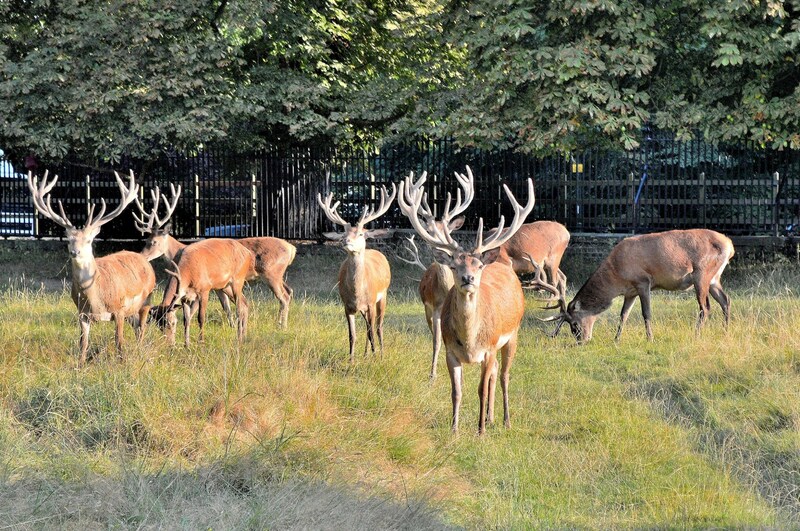 Some deer herds (those around London) carry Lyme Disease which is spread by ticks. It is quite difficult to pick up but such places are not suitable for lounging in the grass or for bare legs in tall grass. This entry was posted on October 7, 2014 by Graham in Hats. 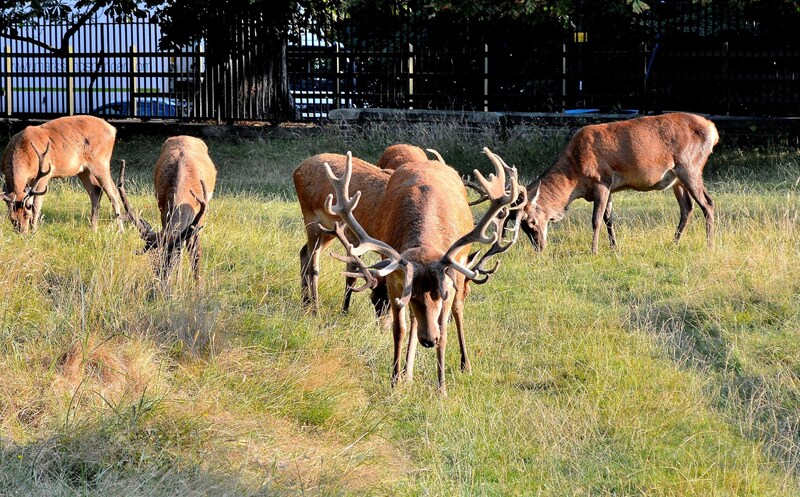 It was filed under Animals, Photography, Travel, uk, West London, Wildlife and was tagged with black deer, bushy park, fallow deer, red deer, wildlife. Those are magnificent! The Black Prince is stately, indeed. They were a welcome surprise. I didn’t expect them to be there, especially not a black one. So. close to the path. I don’t think they can read the signs that say we have to stay 50M apart. A teacher friend from long ago was instructed, by her mischievous friend, all about crocodiles including that they grow 30M long.